» Can we get kids to ride bikes? Can we get kids to ride bikes? Volunteers waited at Monteith Riverpark, and they waited in vain. The first “Albany Bike Ride for Kids” turned out to be a bust, but it should not be taken as a discouraging sign. Getting kids interested in cycling doesn’t depend on events. It comes on its own if it comes at all. The Albany Bicycle and Pedestrian Advisory Commission said it invited children who had completed this year’s bike safety program in the schools, and their parents, on a short ride from Monteith Riverpark on Sunday. 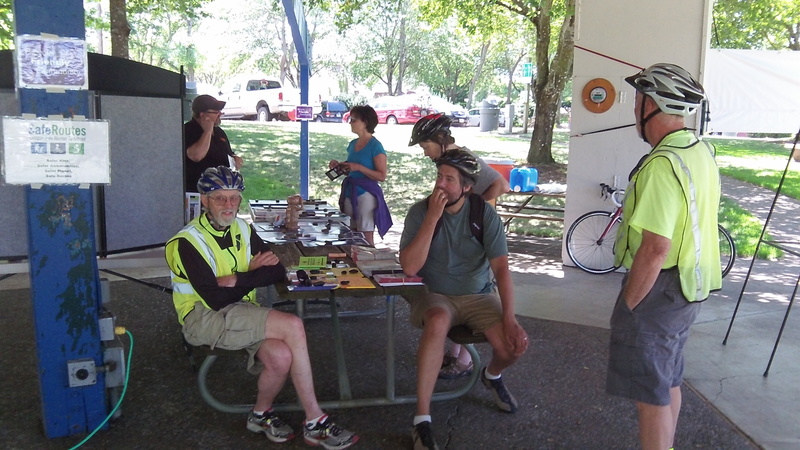 The idea was to give the kids a chance “to demonstrate their new riding skills to their parents and to promote the cycling opportunities for families in Linn County,” in the words of the invitation I saw. Volunteers were on hand for bike safety checks and fitting of helmets. But in the event, not a single one of the invited children or their parents showed up. Does this mean anything? Only that a chance to go for an organized, regulated short bike ride with adults — and possibly even your mom or dad — may not seem the best way to spend a summer Sunday if you have just survived the fifth grade. If these young people have not discovered it already on their own, some of them may soon find that a decent bicycle is a ride to freedom and independence. Given enough time, there is nowhere they cannot go on a bike. The whole town is theirs if they want it, the whole county even, and neighboring ones as well. But if they don’t want to go anywhere, or if they can’t think of anywhere to go, pushing them is bound to have little effect. Unfortunately — for them — too many young people’s bikes are totally unsuitable for riding, especially riding any distance. Wrong geometry and fit, wrong equipment when it rains, wrong everything. These rigs may be OK for stunts or jumps, or just showing off, but that’s about it. So what would encourage more frequent use of good bikes, in town and in the country, by the young and everybody else? The main thing is places to ride. In the countryside this means roads wide enough, or with decent shoulders, so vehicles going in opposite directions can pass each other without almost knocking cyclists into the ditch. In town it requires a sustained campaign to encourage sharing the streets, and enforcement to drive the point home. Not only fun, safe, and practical, but also excellent exercise for our couch-potato youth.